, or more commonly Guarini (Battista), an eminent pastoral poet, descended in the fourth degree from Guarino Veronese, was born at Ferrara in 1537. 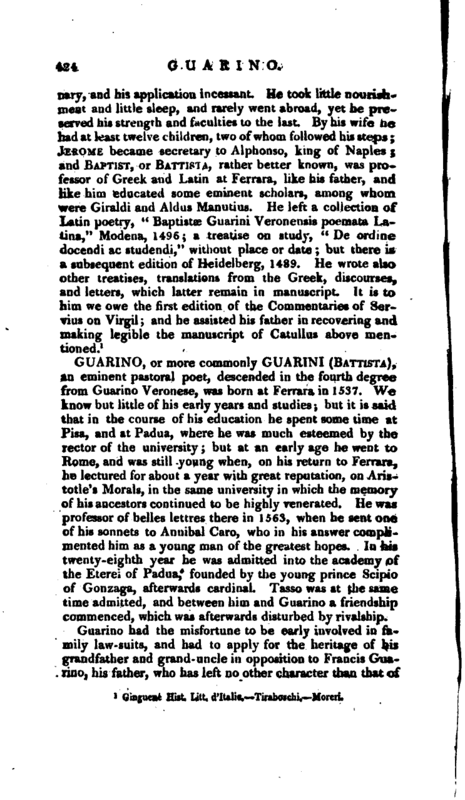 We know but little of his early years and studies; but it is said that in the course of his education he spent some time at Pisa, and at Padua, where he was much esteemed by the rector of the university; but at an early age he went to Rome, and was still young when, on his return to Ferrara, he lectured for about a year with great reputation, on Aristotle’s Morals, in the same university in which the memory of his ancestors continued to be highly venerated. He was professor of belles lettres there in 1563, when he sent one of his sonnets to Annibal Caro, who in his answer complimented him as a young man of the greatest hopes. In his twenty-eighth year he was admitted into the academy of the Eterei of Padua, founded by the young prince Scipio of Gonzaga, afterwards cardinal. Tasso was at the same time admitted, and between him and Guarino a friendship commenced, which was afterwards disturbed by rivalship. 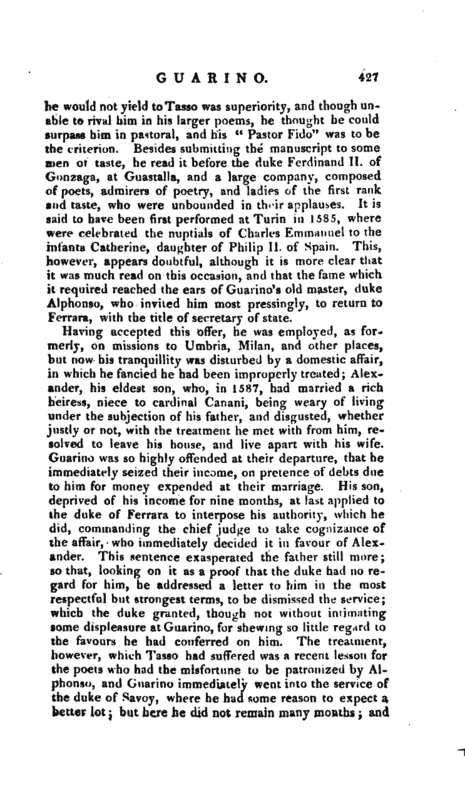 Guarino had the misfortune to be early involved in family law-suits, and had to apply for the heritage of his grandfather and grand- uncle in opposition to francis Guahuo, his father, who has left no other character than that of | a keen sportsman, and who was the only one of the family that had no taste for literature. Having lost his first wife, he married again to injure his son’s interest; hut the duke Hercules II. interposed, and assigned to our poet a proportion of the family property, which was very considerable. Battista married himself about this time Taddea Bendedei, a lady of a noble family of Ferrara. In his thirtieth year he entered into the service of the duke Alphonso II. ; but there seems some difficulty in understanding the order and nature of the business on which he was employed, and the origin of the title of knight which is usually joined to his name, and which he had engraven on the seal with which he sealed his letters. 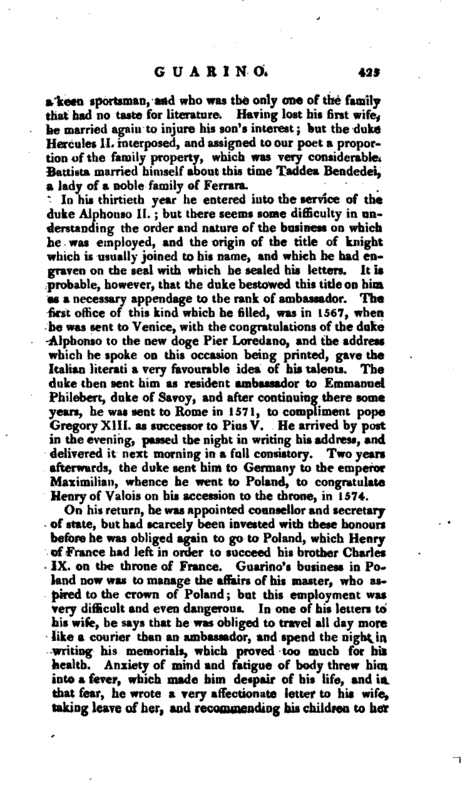 It is probable, however, that the duke bestowed this title on him as a necessary appendage to the rank of ambassador. The first office of this kind which he filled, was in 1567, when he was sent to Venice, with the congratulations of the duke Alphonso to the new doge Pier Loredano, and the address which he spoke on this occasion being printed, gave the Italian literati a very favourable idea of his talents. The duke then sent him as resident ambassador to Emmanuel Philebert, duke of Savoy, and after continuing there some years, he was sent to Rome in 1571, to compliment pope Gregory XIII. as successor to Pius V. He arrived by post in the evening, passed the night in writing his address, and delivered it next morning in a full consistory. Two years afterwards, the duke sent him to Germany to the emperor Maximilian, whence he went to Poland, to congratulate Henry of Valois on his accession to the throne, in 1571. On his return, he was appointed counsellor and secretary of state, but had scarcely been invested with these honours before he was obliged again to go to Poland, which Henry of France had left in order to succeed his brother Charles IX. on the throne of France. Guarino’s business in Poland now was to manage the affairs of his master, who aspired to the crown of Poland; but this employment was very difficult and even dangerous. In one of his letters to his wife, he says that he was obliged to travel all day more like a courier than an ambassador, and spend the night in writing his memorials, which proved too much for his health. Anxiety of mind and fatigue of body threw him into a fever, which made him despair of his life, and in that fear, he wrote a very affectionate letter to his wife, taking leave of her, and recommending his children to her | care. It appears by his correspondence that it was not entirely on account of his ^aierits that he was employed in these distant and intricate missions, and that he had enemies at Ferrara, who made use of his reputation and the confidence the prince had in him, to get him removed. This, however, did not abate his zeal for the interests of his master, although the negociation was not successful, nor was he ever rewarded suitably to his exertions. 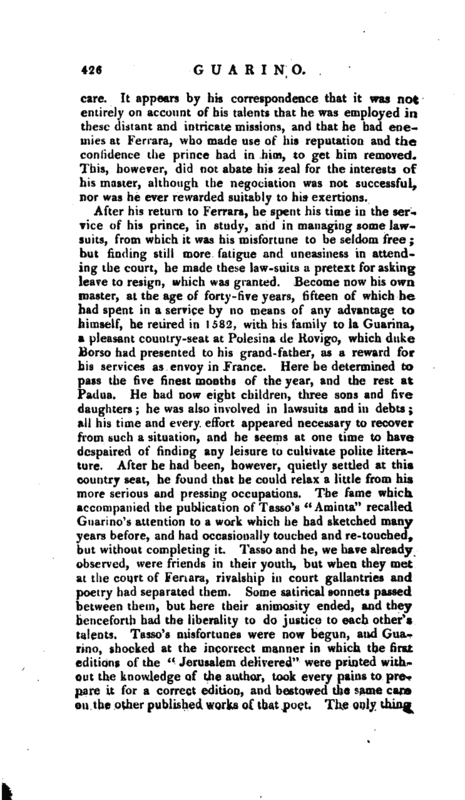 After his return to Ferrara, he spent his time in the service of his prince, in study, and in managing some lawsuits, from which it was his misfortune to be seldom free; but finding still more fatigue and uneasiness in attending the court, he made these law-suits a pretext for asking leave to resign, which was granted. 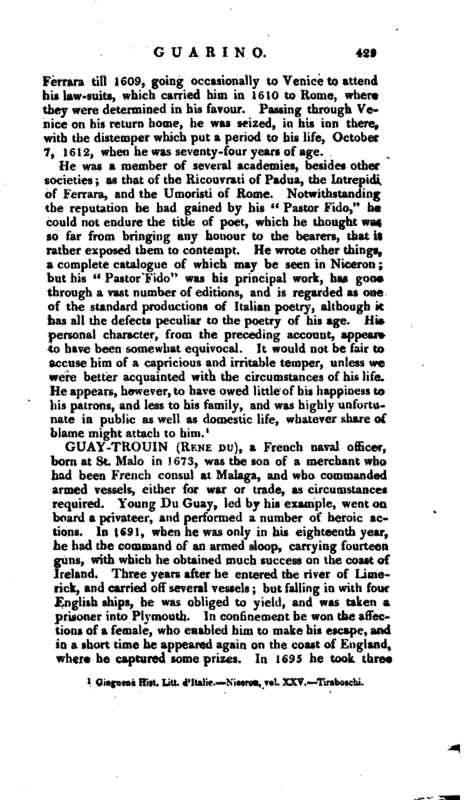 Become now his own master, at the age of forty-five years, fifteen of which he had spent in a service by no means of any advantage to himself, he retired in 1582, with his family to la Guarina, a pleasant country-seat at Polesina de Itovigo, which duke Borso had presented to his grand-father, as a reward for his services as envoy in France. Here he determined to pass the five finest months of the year, and the rest at Padua. He had now eight children, three sons and five daughters; he was also involved in lawsuits and in debts; all his time and every effort appeared necessary to recover from such a situation, and he seems at one time to have despaired of finding any leisure to cultivate polite literature. After he had been, however, quietly settled at this country seat, he found that he could relax a little from his more serious and pressing occupations. The fame which accompanied the publication of Tasso’s “Aminta” recalled Guarino’s attention to a work which he had sketched many years before, and had occasionally touched and re-touched, but without completing it. Tasso and he, we have already observed, were friends in their youth, but when they met at the court of Ferrara, rivulship in, court gallantries and poetry had separated them. Some satirical sonnets passed between them, but here their animosity ended, and they henceforth had the liberality to do justice to each other’s talents. Tasso’s misfortunes were now begun, and Guarino, shocked at the incorrect manner in which the first editions of the “Jerusalem delivered” were printed without the knowledge of the author, took every pains to prepare it for a correct edition, and bestowed the same care on the other published works of that poqt. The only thing | be would not yield toTasso was superiority, and though unable to rival him in his larger poems, he thought he could surpass him in pastoral, and his “Pastor Fido” was to be the criterion. Besides submitting the manuscript to some men of taste, he read it before the duke Ferdinand II. of Gonzaga, at Guastalla, and a large company, composed of poets, admirers of poetry, and ladies of the first rank and taste, who were unbounded in their applauses. It is said to have been first performed at Turin in 1585, where were celebrated the nuptials of Charles Emmanuel to the infanta Catherine, daughter of Philip II. of Spain. This, however, appears doubtful, although it is more clear that it was much read on this occasion, and that the fame which it required reached the ears of Guarino’s old master, duke Alphonso, who invited him most pressingly, to return to Ferrara, with the title of secretary of state. Having accepted this offer, he was employed, as formerly, on missions to Umbria, Milan, and other places, but now his tranquillity was disturbed by a domestic affair, in which he fancied he had been improperly treated;Alexander, his eldest son, who, in 1587, had married a rich heiress, niece to cardinal Canani, being weary of living under the subjection of his father, and disgusted, whether justly or not, with the treatment he met with from him, resolved to leave his house, and live apart with his wife. Guarino was so highly offended at their departure, that he immediately seized their income, on pretence of debts due to him for money expended at their marriage. His son, deprived of his income for nine months, at last applied to the duke of Ferrara to interpose his authority, which he did, commanding the chief judge to take cognizance of the affair, who immediately decided it in favour of Alexander. This sentence exasperated the father still more; so that, looking on it as a proof that the duke had no regard for him, he addressed a letter to him in the most respectful but strongest terms, to be dismissed the service; which the duke granted, though not without intimating some displeasure at Guarino, for shewing so little regard to the favours he had conferred on him. 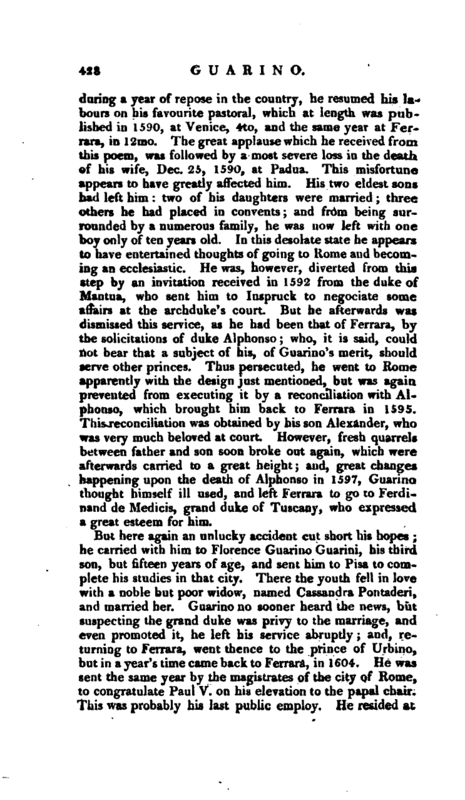 The treatment, however, which Tasso had suffered was a recent lesson for the poets who iiad the misfortune to be patronized by Alphonso, and Guarino immediately went into the service of the duke of Savoy, where he had some reason to expect a better lot; but here he did not remain many months; and | during a year of repose in the country, he resumed his labours on his favourite pastoral, which at length was published in 1590, at Venice, 4to, and the same year at Ferrara, in 12mo. The great applause which he received from this poem, was followed by a most severe loss in the death of his wile, Dec. 25, 1590, at Padua. This misfortune appears to have greatly affected him. His two eldest sons had left him two of his daughters were married three others he had placed in convents and from being surrounded by a numerous family, he was now left with one boy only often years old. In this desolate state he appears to have entertained thoughts of going to Home and becoming an ecclesiastic. He was, however, diverted from this step by an invitation received in 1592 from the duke of Mantua, who sent him to Inspruck to negociate some affairs at the archduke’s court. But he afterwards was dismissed this service, as he had been that of Ferrara, by the solicitations of duke Alphonso; who, it is said, could not bear that a subject of his, of Guarino’s merit, should serve other princes. Thus persecuted, he went to Rome apparently with the design just mentioned, but was again prevented from executing it by a reconciliation with Alphonso, which brought him back to Ferrara in 1595. This reconciliation was obtained by his son Alexander, who was very much beloved at court. However, fresh quarrels between father and son soon broke out again, which were afterwards carried to a great height; and, great changes happening upon the death of Alphonso in 1597, Guarino thought himself ill used, and left Ferrara to go to Ferdinand de Medicis, grand duke of Tuscany, who expressed a great esteem for him. But here again an unlucky accident cut short his hopes; he carried with him to Florence Guarino Guarini, his third son, but fifteen years of age, and sent him to Pisa to complete his studies in that city. There the youth fell in love with a noble but poor widow, named Cassandra Pontaderi, and married her. Guarino no sooner heard the news, but suspecting the grand duke was privy to the marriage, and even promoted it, he left his service abruptly; and, returning to Ferrara, went thence to the prince of Urbino, but in a year’s time came back to Ferrara, in 1604. He was sent the same year by the magistrates of the city of Rome, to congratulate Paul V. on his elevation to the papal chair. This was probably his last public employ. He resided at | Ferrara till 1609, going occasionally to Venice to attend his law-suits, which carried him in 1610 to Rome, where they were determined in his favour. Passing through Venice on his return home, he was seized, in his inn there, with the distemper which put a period to his life, October 7, 1612, when he was seventy-four years of age. 1 Gingoene Hist. Litt. d’ltalie.—Niceron. vol. XXV. —Tiraboschi.